NVQ2 & NVQ3 ACCREDITED DRAINAGE ENGINEERS. We are approved to be on the lot3 register to Thames Waters approved waste network contractors, as from October 2011 if Drainage Contractors are not approved they may face a fine if working on Thames Water network this does not apply to private drains. We are a fully vetted, approved & recommended insurance contractor should the need arise that you have to make a claim on your home insurance policy to cover the cost of any drainage repairs or other types of repairs that may be required, we even pay £100 towards your insurance excess no other company does this, we go above & beyond our customers expectations, Drain CCTV Survey London area. Our motto is Excellence As Standard. Please see our Claim on House Insurance page for more details or contact our Insurance claims management team direct if you have any questions, we are here to help its what we do. All our Drain CCTV Survey engineers are fully qualified to the highest levels & assessed each year with the skills to undertake the most difficult of jobs, some of these skills has taken us a lifetime to learn and gain experience in, we have worked on some of the most complex domestic & commercial drain & civil works issues that others could not or would not attempt as can be seen by some of the comments left by our customers please look at the reviews in the Freeindex link below to read some of these comments. City and Guilds Confined Spaces T/502/1043:, JIB PHMES IDDPC/RS/DRO:, JIB PHMES DM/CCTVO:, FAAW. We are approved on the Thames Water lot3 register to the main waste network contractors so we can carry out various drain works and Drain CCTV Survey others can't. Ask other contractors their level of accreditation as the vast majority do not have any, which in the event of an accident or mistake carrying out repairs on your property your insurance company may not accept any claims due to the contractors not being accredited to carry out such works, so please be warned. WE ARE CHEAPER THAN ALL OUR RIVALS THAT'S A FACT READ ON TO SEE WHY AND IF YOU FIND A CHEAPER CCTV SURVEY WE WILL MATCH IT. DRAINAGE EXPERTS USE THE INDUSTRY STANDARD WINCAN DRAINAGE REPORTING SOFTWARE WHICH IS ACCEPTED BY THE UTILITY WASTE NETWORKS LIKE THAMES WATER. WE ALSO OFFER A GUARANTEE IF A BLOCKAGE THAT WE HAVE CLEARED RETURNS WITHIN 7 DAYS WE WILL RETURN AND CLEAR IT FOR FREE NO OTHER COMPANY OFFERS THIS. DRAINAGE EXPERTS DON'T BELIEVE IN CHARGING BY THE 1/2 OR 1/4 HOUR FOR CCTV SURVEYS LIKE OTHER DRAINAGE COMPANY'S DO AS WE KNOW THIS WORKS OUT MORE EXPENSIVE 99% OF THE TIME FOR YOU THE CUSTOMER. OTHERS CHARGE LIKE THIS BECAUSE THEIR CCTV SURVEYS ARE QUITE EXPENSIVE AND THEY TRY TO MAKE THEM LOOK MORE COST EFFECTIVE BY QUOTING PER 1/2 OR 1/4 HOUR. REMEMBER IT WILL TAKE THEIR ENGINEERS A 1/2 HOUR OR MORE JUST TO GET SET UP & GET READY FOR THE CCTV SURVEY NO MATTER WHAT THEY TELL YOU. AND THEN HOW LONG WILL THE ACTUAL CCTV SURVEY TAKE AND WHAT IF THERE IS AN UNFORESEEN PROBLEM AND THEY WON'T KNOW THIS UNTIL THEIR CAMERA IS ALREADY IN YOUR PIPEWORK BUT BY THEN IT'S TO LATE FOR YOU THE CUSTOMER, BUT HEY WHAT DO THEY CARE THEY ARE CHARGING YOU 1/2 HOURLY THE LONGER IT TAKES THE BETTER IT IS FOR THEM RIGHT. WE KNOW THIS BECAUSE WE DO CCTV SURVEYS DAY IN DAY OUT. WE EVEN FOUND ONE WELL KNOWN COMPANY CHARGING £198+VAT FOR THE FIRST 1/2 HOUR WE ARE MUCH CHEAPER THAN THIS NO MATTER HOW LONG THE SURVEY TAKES THAT'S A PROMISE. DON'T BE FOOLED BY WHAT OTHER DRAINAGE COMPANYS TELL YOU IS CHEAPER IT NEVER IS. NO CALL OUT CHARGES EITHER JUST HARD WORKING DRAINAGE ENGINEERS. REAL COMMENTS LEFT BY REAL PEOPLE THESE CANT BE ADDED OR EDITED BY US AND ARE VERIFIED AS GENUINE BY FREEINDEX THROUGH THEIR RIGOROUS CHECKS. WE USE THE LATEST DRAIN CCTV SURVEYING & SONDE TRACING EQUIPMENT FOR A COMPLETE DRAIN CCTV SURVEY, WE ALSO LEAVE A COLOUR DVD OF THE DRAIN CCTV SURVEY. SO CALL US FOR ALL YOUR DRAIN CCTV SURVEY NEEDS IN LONDON, KENT & ESSEX AREA. REAL REVIEWS BY REAL CUSTOMERS HOW MANY OTHERS CAN SHOW THAT ? LONDONS LEADING FOUL & STORM DRAINAGE EXPERTS. WITH THE LATEST HOME BUYERS REPORT NOW IN ACTION, IT DOES NOT COVER A SURVEY OF THE DRAINS YET IT'S THESE DRAINS THAT RUN YOUR HOME FROM WASTE TO WASHING MACHINES,SINKS,BATHS AND MUCH MORE, DRAINAGE EXPERTS NOW OFFER SUCH A DRAINAGE SERVICE AND IS PROVING A GREAT ASSET IN SELLING YOUR HOME. IT SHOWS THE CONFIDENCE YOU HAVE IN SELLING YOUR HOME, AND MAKES AN ADDED SELLING ADVANTAGE FOR YOU OVER OTHERS IF YOU HAVE YOUR DRAINAGE BUYERS REPORT INCLUDED AND IT WONT COST YOU THE EARTH. LET YOUR PROSPECTIVE BUYERS KNOW THEY ARE BUYING A HOUSE THAT'S SHIP SHAPE. LONDON, KENT AND SURROUNDING AREAS. OUR DRAIN CCTV SURVEY AND DRAIN RELINING ENGINEERS ARE EXPERTS IN ALL TYPES OF FOUL & STORM DRAINAGE SERVICES AND CARRY OUT DRAIN CCTV SURVEYS TO A VERY HIGH STANDARD. NEW WATER SERVICES LAID, DO YOU HAVE OLD LEAD PIPEWORK ( 90% OF HOMES DO ) SUPPLYING YOU WITH BAD WATER PRESSURE WE CAN SOLVE THIS WITH TRENCH LESS TECHNOLOGY AND AT A FRACTION OF THE COST OTHERS CHARGE. DRAINAGE EXPERTS ARE A LONDON & KENT BASED DRAINAGE COMPANY WE ARE EXPERTS IN ALL TYPES OF FOUL, STORM AND SURFACE DRAINAGE SYSTEMS, DRAINAGE RINGS, DRAIN MAINTENANCE, DRAIN RELINING SERVICES WITH A FULL CCTV SURVEY ON COMPLETION, FULL COLOUR DRAINAGE CCTV SURVEYS, BLOCKED DRAINS. WE BUILD CHAMBERS FOR ALL TYPES OF DRAINAGE SYSTEMS WHETHER IT'S IN CONCRETE, BRICK OR EVEN PLASTIC. FRENCH DRAINS ETC SEPTIC TANKS & SOAK, CESSPITS ETC, OUR DRAIN ENGINEERS ARE SOME OF THE BEST AND WE DO WORK FOR SOME OF THE OTHER LEADING DRAINAGE COMPANY AND LOCAL HOUSING AUTHORITY IN AND AROUND LONDON, AS WELL AS HOUSE BUILDERS & HOMEOWNERS ETC. DRAINAGE EXPERTS LONDON - KENT & ESSEX AREAS COVERED. WE ARE A RECOGNIZED DRAINAGE COMPANY AND PRIDE OURSELVES ON THE DRAIN CCTV AND DRAIN RELINING SERVICES WE PROVIDE IN THE LONDON, KENT & ESSEX AREA. TO EMAIL US CLICK HERE AND SEE HOW WE CAN HELP. 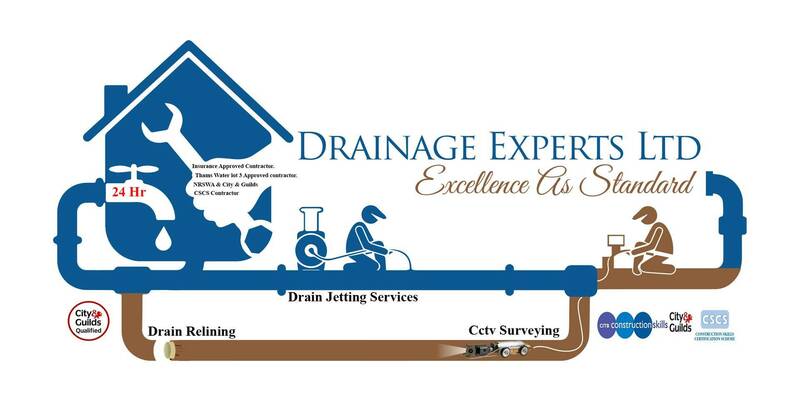 DRAINAGE EXPERTS LTD FOR ALL LONDON & KENT HOMEOWNERS, DEVELOPERS & COMMERCIAL PROPERTY OWNERS. DRAINAGE EXPERTS LTD ALSO DO LANDSCAPING,BLOCK PAVING,FENCING AND ALL TYPES OF BUILDING SERVICES FROM DRAIN MAINTENANCE & REPAIRS, BLOCKED DRAINS, SINKS, TOILETS. DRAINAGE EXPERTS IN FOUL & STORM DRAINAGE ALL MAINTENANCE & REPAIRS CARRIED OUT, LONDON, KENT AND SURROUNDING AREAS. DRAINAGE EXPERTS, BELIEVE IN GIVING THE BEST POSSIBLE COSTINGS FOR ALL YOUR DRAIN CCTV SURVEYS , DRAIN RELINING, DRAIN TRACING, SEPTIC TANKS,DRAIN JETTING ETC, DRAIN CHANNELS INSTALLED, NEW WATER SERVICES LAID AND MUCH MORE. 24 HR EMERGENCY PLUMBER LONDON, KENT, ESSEX, SURREY AREA. WE HAVE A LARGE CUSTOMER BASE WITH REPEAT CUSTOMERS FROM HOMEOWNERS TO LARGE COMPANIES SO WE UNDERSTAND THE DEMANDING NEED TO KEEP COSTS DOWN FOR YOU THE CUSTOMER. WE WON'T BE BEATEN ON PRICE IF YOU FIND A CHEAPER DRAIN CCTV SURVEY ETC WE WILL BEAT THAT QUOTE PROVIDING YOU CAN PROVIDE PROOF OF THEIR QUOTE HOW'S THAT. MACHINE DRIVER ALSO FOR HIRE DAY RATES APPLY.